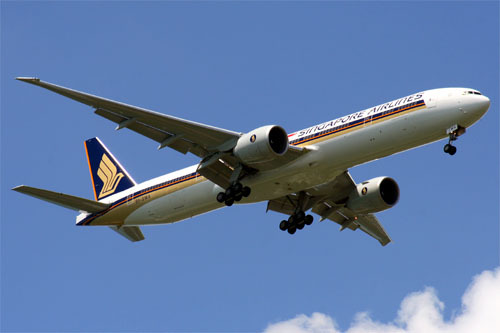 Singapore Airlines has announced the launch of four, weekly nonstop flights from Houston to Moscow, with continuing service to Singapore, beginning March 20, 2008. Houston becomes the sixth gateway in the carrier's North American network, which includes Los Angeles, San Francisco, Newark, New York (JFK) and Vancouver. Singapore Airlines flight SQ 61 will depart from Terminal D at Houston's George Bush Intercontinental Airport (IAH) at 11:55 p.m. each Tuesday, Thursday, Saturday and Sunday, arriving at Domodedovo International Airport (DME) in Moscow at 7:10 p.m. the next day. After a brief layover, the flight continues to Singapore, departing Domodedovo International Airport at 8:25 p.m., and arrives at Changi International Airport at 11:30 a.m. the following day. On the return leg, flights departing Singapore (Tuesday, Thursday, Saturday and Sunday at 09:45 a.m.) offer the convenience of same-day arrivals in Houston (10:20 p.m.). The carrier will operate its newest Boeing 777-300 Extended Range aircraft on the route in a three-class configuration (8 First Class, 42 Business Class and 228 Economy Class seats). The new Singapore Airlines flight will become the first-ever nonstop service connecting Houston and Moscow. It provides convenient new travel options to Russia, as well as a convenient link to the carrier's extensive network of flight connections throughout Asia for corporate and leisure travelers alike. "We know that Texans appreciate luxury, service and quality, so it seems only fitting to launch our new Houston flights with the world's largest First Class and Business Class product," said Mr. W.K. Lim, regional vice president Americas for Singapore Airlines, referencing seats up to 35 inches wide on the carrier's new Boeing 777 aircraft. "We're very pleased to bring one of the world's newest and most elegant airline experiences to the Houston market." Named "World's Best International Route Airline" by the readers of Conde Nast Traveler magazine for 19 of the past 20 years, Singapore Airlines is world-renowned for innovation and attentive inflight service. Singapore Airlines' new First Class includes 35-inch wide seats converting to 180-degree, flat beds, complete with the airline's famous turndown service featuring oversized down duvets, pillows and tailored sleep suits from Givenchy. Noise-cancelling headphones and a 23-inch digital monitor give access to more than 1,000 on-demand entertainment options. The carrier's new Business Class seat - the largest in aviation history - converts to a 180-degree, flat bed and features a spacious 1-2-1 Business Class configuration, providing direct aisle access from every seat. The new flight will also feature Singapore Airlines' recently launched Economy Class, offering wider seats, greater seat recline, and 10.6-inch digital video monitors at every seat for access to the award-winning KrisWorld on-demand entertainment system.